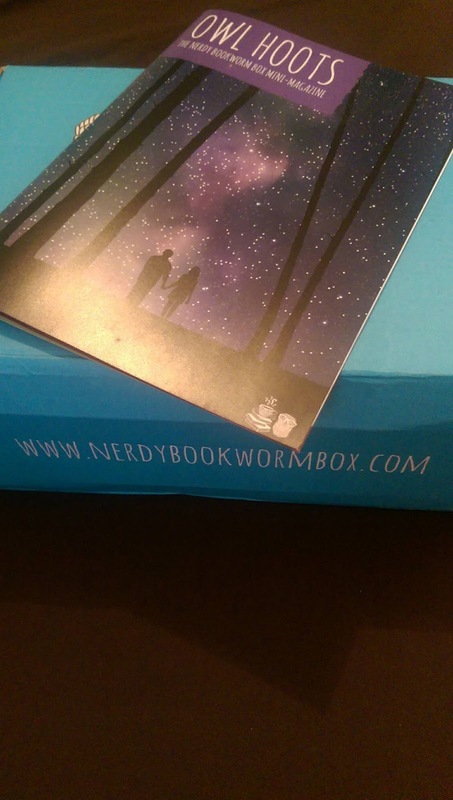 This month I ordered a Nerdy Bookworm Box from nerdybookwormbox! It was £29.99 (or £27.99 if you're subscribed) and I received it today. I've seen many unboxing of subscription boxes and it seems they're not worth the money for what you get but this is definitely not the case for this box. 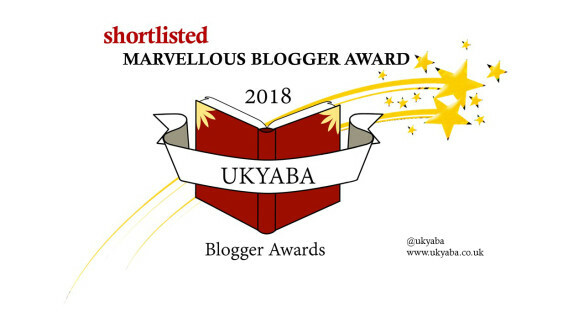 Get sucked into this engaging YA fantasy by Katharine and Elizabeth Corr. 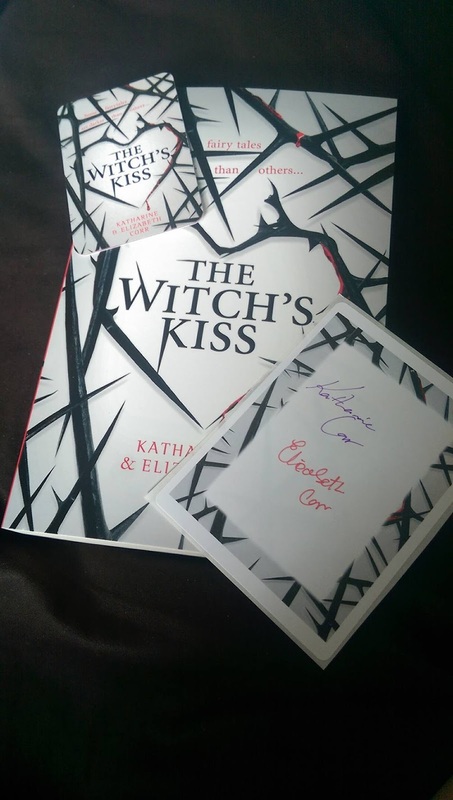 The authors have contributed signed bookplates and promotional cards for you to enjoy with your read. Relax and enjoy the Jasmine scent of the Night Court with this Rhysand-inspired violet bath bomb custom-made for this box by GeekyClean. This is probably my favourite item from the box, mainly because Rhysand is one of my favourite characters, he's just dreamy. 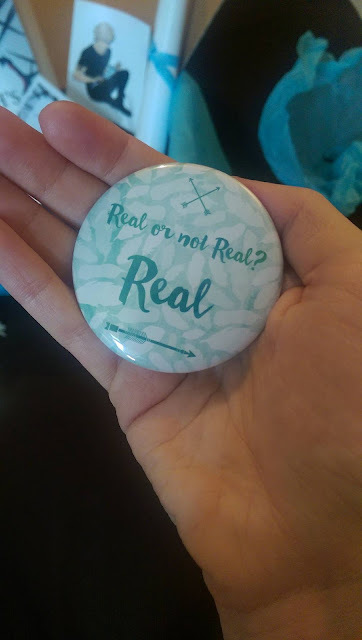 Help Peeta remember what's real with this custom-designed pocket mirror made my Literary Emporium. 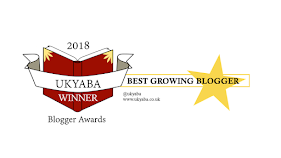 This is stunning and a lovely mirror to carry around in your bag. The next item I opened was a Rowan Whitehorn (from the Throne of Glass series) candle. 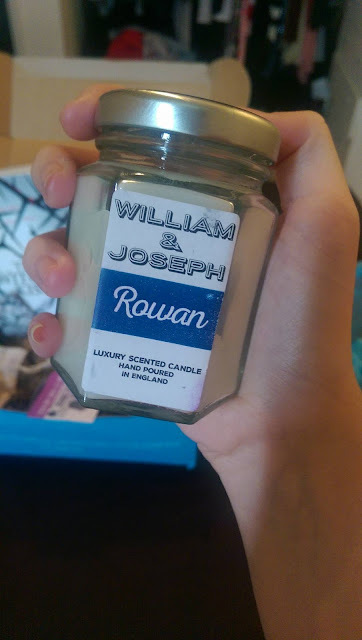 Spark up a light for this Rowan-inspired candle, customised for this box by William and Joseph. This masculine scent includes sandalwood, amber and musk, pepper and leather. 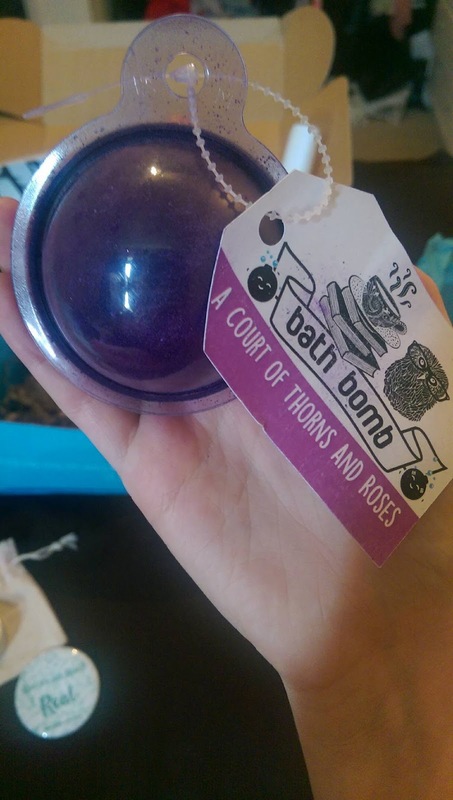 This smells absolutely incredible. It smells like something Molton Brown produced. It reminds me of their Black Peppercorn scent which I absolutely adore. 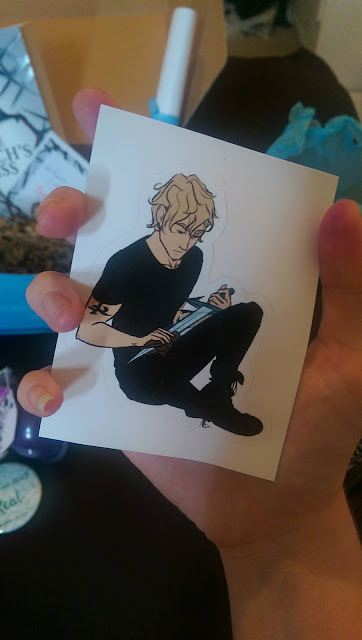 Show off your love for the Shadowhunters with this Jace sticker, perfect for a laptop or a shelf. 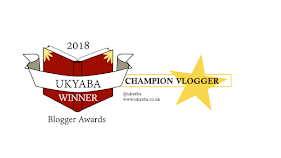 This design was created by taratjah. This is pretty self-explanatory. 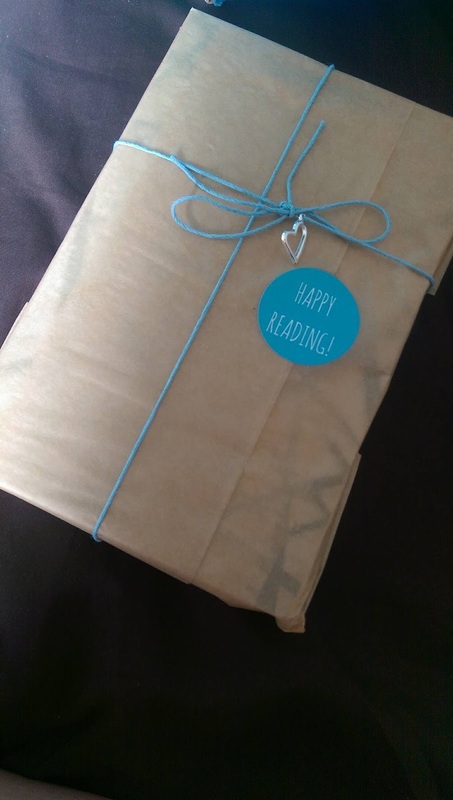 It's super cute and who doesn't love Shadowhunters? 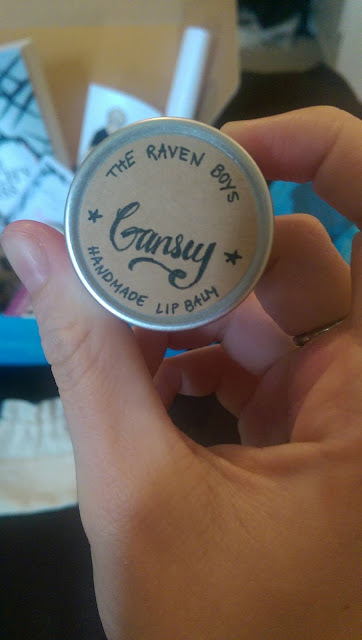 Get ready to kiss your Raven Boy with this customised minty balm from Literary Lip Balms. 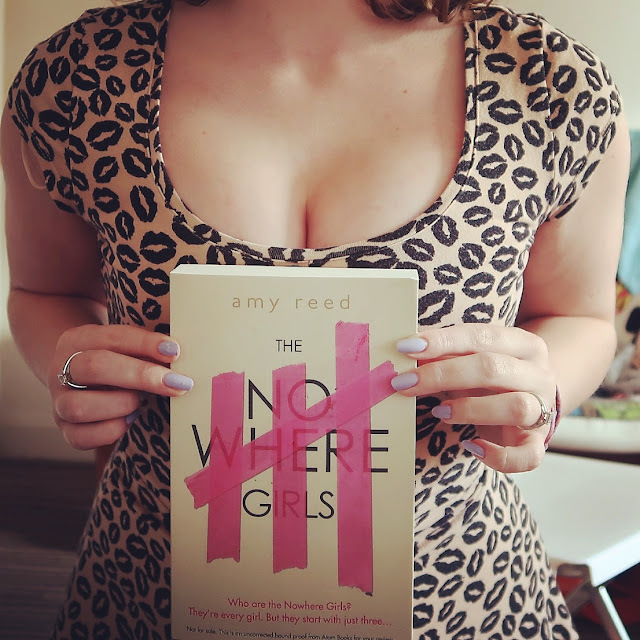 This is lovely on and has a very strong pepperminty taste...it's delicious! 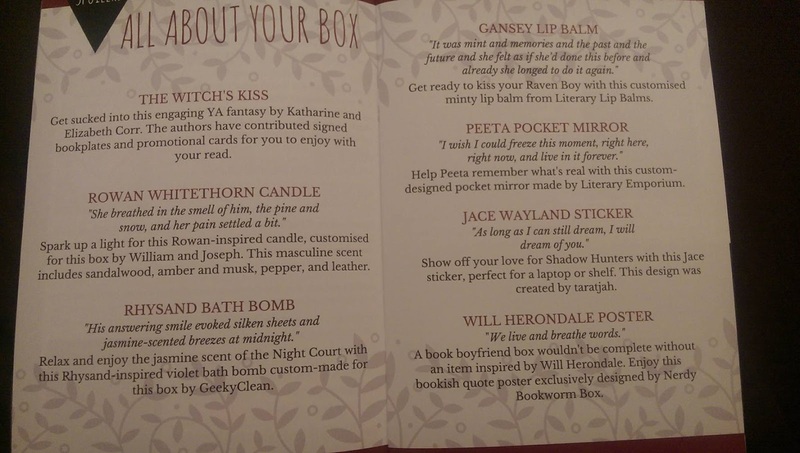 A Book Boyfriend box wouldn't be complete without an item inspired by Will Herondale. 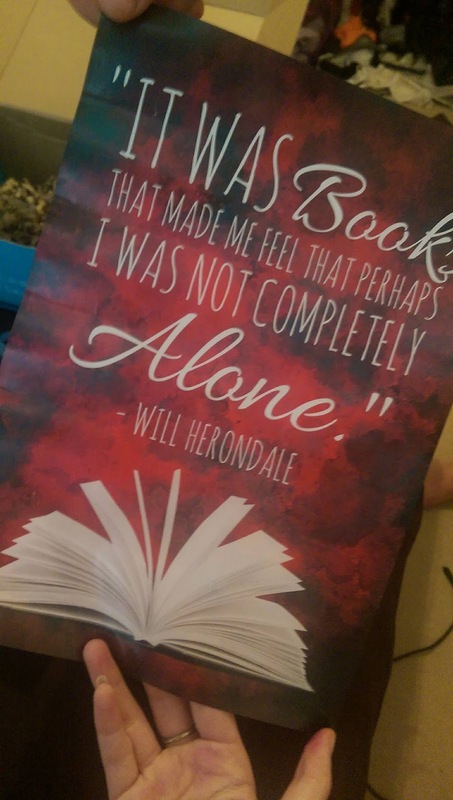 Enjoy this bookish quote poster exclusively designed by Nerdy Bookworm Box. This is beautiful and a very apt quote...this definitely has a home on my wall somewhere. I am so happy with this box and will be ordering August's one. 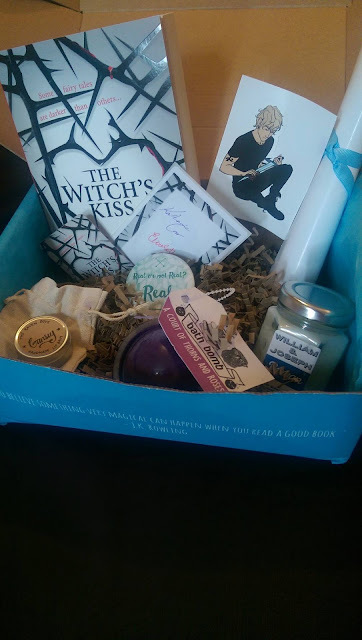 If you would like to get 10% off your first box, type in "BOOKS008". 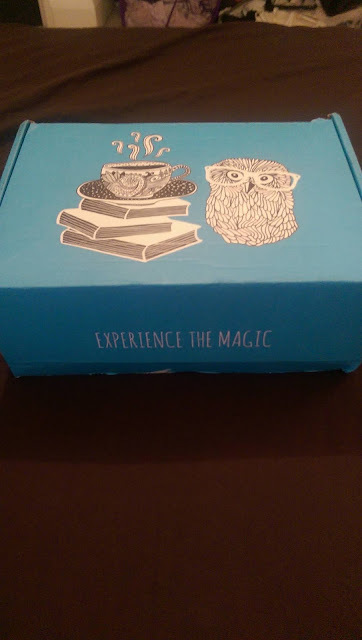 Then when you get your box and refer 4 friends that buy a box...you get a box free! I would definitely recommend this box and I am definitely a satisfied customer.